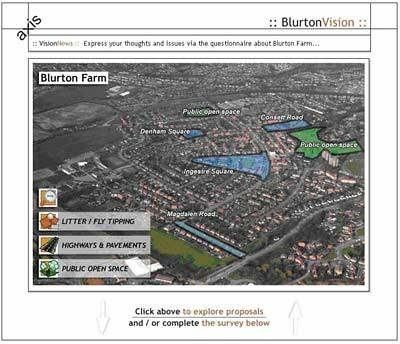 Developed in unison with face to face public events, the web site provided a forum for both the appraisal of issues and publication of design proposals in order to receive votes. The proposals that form the final report put forward to Renew North Staffordshire range from site specific residential and commercial interventions, to area wide initiatives for community support roles. Computer hardware was provided to the resident groups as an endowment to the communities future. Input from hard to reach groups such as the youth community was sought by overseeing a photography competition that encouraged commentary through images.